A torch used in the 1980 Summer Olympics torch relay. 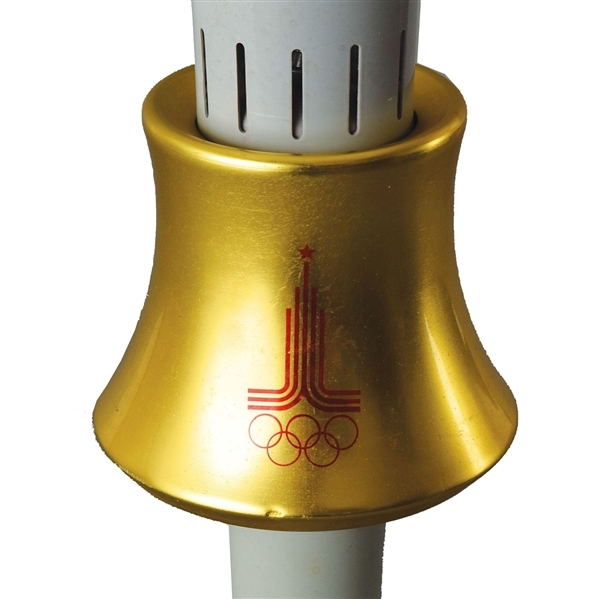 The torch is made of painted and spun anodized alloy and features the 1980 Summer Olympics logo on the protective handle cover as well as "Moskva Olimpiada 1980" (Moscow Olympics 1980) on the exterior. The 1980 Olympic torch relay was conducted entirely on foot. Torchbearers carried the torch during the 30-day torch relay through Bulgaria and Romania to Moscow, covering a final distance of 4,976 kilometers. Having been used in the torch relay, this torch has some discoloration at the top from the Olympic flame. The 1980 Summer Olympic Games was the first to be held in a communist country, resulting in more than 60 countries boycotting the Games.